A time period is the definition of a time interval for each day of the week. These time periods enable the functionalities of the scheduler over a given period of time. 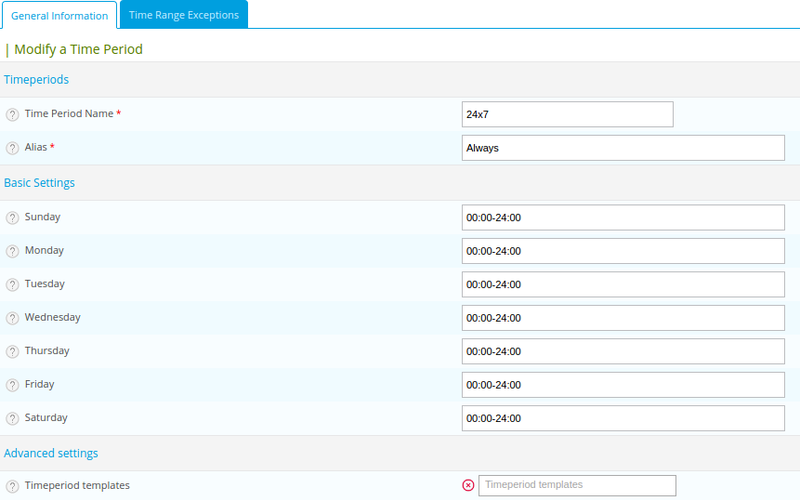 The configuration of time periods is done in the menu: Configuration > Users > Time periods. The Time period name and Alias fields define the name and description of the time period respectively. The fields belonging to the Time range sub-category define the days of the week for which it is necessary to define time periods. The Exceptions table enables us to include days excluded from the time period. 24 hours a day and 7 days a week: 00:00-24:00 (to be applied on every day of the week). From 08h00 to 12h00 and from 14h00 to 18h45 on weekdays: 08:00-12:00,14:00-18:45 (to be applied on weekdays only). The exceptions allow us to include exceptional days in the time period (overload of the definition of regular functioning of the day). january 1 00:00-24:00 All day on the 1st of January, every year. In the extended settings, it is possible to include or to exclude periods in the definition of the object. To obtain the office closing hours, we simply have to create a time period in which we include the period 24x7 and from which we exclude the working_hours period.